NOTE from Margie: Look below in the article where I have these NOTE. Anyone who goes to New Delhi and can cough up about 283,881 dollars can button up for a sub-orbital ride around the Earth 2012 onwards, the European space company, EADS Astrium, said Friday at the International Astronautical Congress in India's southern city Hyderabad. EADS Astrium is the space subsidiary of the French-Spanish-German consortium EADS. "For a sum of 200,000 euros one can take a space ride in Earth's lower orbits lasting a few hours," said Christophe Chavagnac, Astrium's chief engineer and space tourism project manager. "Space tourists will be able to experience what has been a privilege for about 450 astronauts and cosmonauts who flew into outer space and beyond over the past five decades on scientific and exploratory missions," said Chavagnac. In addition the European Aeronautic Defence and Space (EADS) Astrium's will be available worldwide, for which the agency will put together a fleet of space shuttles in the next five years. Sometime after 2012 a once-a-week trip will be operational in a space plane that will take off like an aeroplane and get into hypersonic mode to zip like a rocket into outer space to about 100 kilometers above earth. Astrium plans to begin the project in 2009 when the initial funding of one billion dollars is expected. 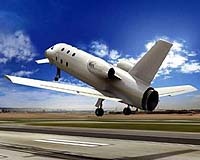 It has already developed the plane, which will seat four passengers in one trip so that they can better experience weightlessness, said Chavagnac. Only the Russian Space Agency (Roskosmos) has organized such trips before, with 60-year-old US millionaire businessman Dennis Tito becoming the world's first space tourist in April 2001, allegedly paying 20 million dollars for the sub-orbital sojourn. Tito flew in the Russian spacecraft Soyuz that docked with the International Space Station (ISS). Roskosmos has received bookings till 2009 to fly space tourists to the ISS on its Soyuz spacecraft for about 30 million dollars. US space agency NASA was the first to attempt space tourism. In 1986, it put US teacher Christa McAuliffe along with a crew aboard space shuttle Challenger, which exploded, killing all members on board. The Paris-based EADS is an aerospace corporation formed by the merger of Aerospatiale-Matra of France, Construcciones Aeronauticas SA (CASA) of Spain and DaimlerChrysler Aerospace AG (DASA) of Germany.